It’s a nice balmy -7 degrees (windchill -22) here in south central Wisconsin. Tonight however, the temperature will be approaching -31 degrees with a windchill of -57 (that is -31 Celsius with a windchill of -49c). Could there be a better day to read a story about fighting in the broiling Saharan desert? This story appeared in the DC comic Danger Trail (Issue #3) which was a title that only lasted for five issues and appeared in the comic racks from 1950 to 1951. Too bad, it was a very nice series and featured stories of adventure from around the world. 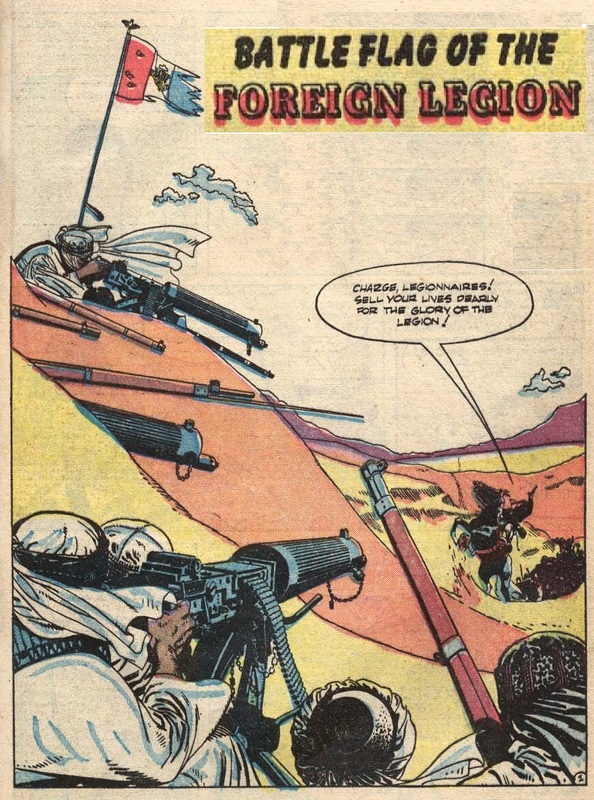 It appeared there were going to be several recurring figures in this comic to include the beginnings of King Faraday, Radioman Ross and a poor investigator of the Foreign Legion known as Francois of the Foreign Legion who appeared in issue 2. Many of the stories in Danger Trail seemed to be of the exotic private eye, reporter, or adventurer and their sordid dealings in the underworld of Egypt, Malaya, Paris and other exotic locales. This entry was posted in Legion Comics. Bookmark the permalink. I’ve got a photo to send you but I don’t know how to. It’s jpeg format. Thanks. I will send it tomorrow. People use to think of desert with sun and heat, snow seems impossible to exist. Exept Frison Roche in his book “sahara”. And I thought my -5c tonight here in the UK tonight was cold! Hope you stay warm with your Saharan tale. -3 near Paris, but no camel convoy abroad.